Fully customizable notification patterns (including multi-color notifications, custom vibration patterns). Notification content filters (only interested in SMS notifications for certain people? not a problem for Mi Band Tools). 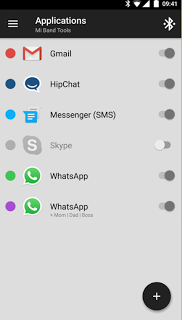 Multiple notifications per application (thanks to this feature, you can set different patterns for single application, for example you can set WhatsApp messages from your boss in red and from your friends in blue). Power Nap feature (need a short nap? Just activate this and Mi Band will wake you up by vibrations when you’re done resting). Idle Alerts (you can set an alert so the band will buzz you if you’ve been inactive for some time). You can also control the interval, time frame and inactivity threshold. 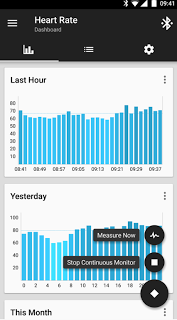 Configurable notifications times (even separately for weekends) and conditions (globally and per notification). Advanced settings (disable non-interactive notifications, shake to dismiss power nap, disable in silence mode, disable while screen is on, …). Missed notifications (notification is not lost when you are out of reach of your phone, you will get the last missed notification on reconnect). Export/Import Settings (to your storage or to the cloud). Tasker, Automagic, Automate and Locale support (advanced and fully customizable action plugins). Designed completely according to Google’s Material Design guidelines and best practices in mind. Many of ‘those little things’, for example, application automatically detects the dominant color of an application icon / contact picture and preselects it for you. 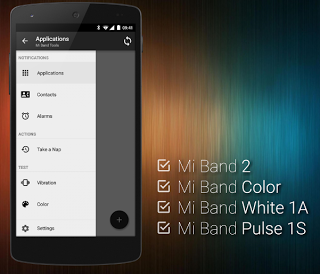 Fully supports all original Mi Band bracelets (including the white-only 1A version for which Mi Band Tools automatically adjusts the user interface to match the features supported by this bracelet version).